When you can think back to the big decisions in life and say, "That was the best decision I've ever made!" isn't that a good feeling? Professionally, joining the Idaho Air National Guard was, without a doubt, the best decision I have ever made. The Guard has helped me feel like I belong to something—something so much greater than myself. I have the ability to serve, volunteer, meet new people, have my voice be heard, strive for excellence, learn new skills, put a purpose behind my passion for fitness and running, and so much more. Every drill weekend, there's something new that's happening or a big change that's taking place. As this blog is my online diary, these are things that I want to be sharing, but due to the nature of this new line of work, I have to limit what I can put out there. I apologize in advance to any of you who come here hoping for career updates. Times are sensitive right now, and I have to withhold from publishing all the amazing things I'm experiencing (and trust me, there are a lot!). While I'd love to give constant "this is why the Air Guard is the best thing ever" and "this is what we do in the Air Guard" posts, I'm honestly unable to. It's sad, too, because it's interesting, rewarding, exciting, and ever-changing. But I have to—for myself, for my family, for my fellow guardsmen, and for my unit. 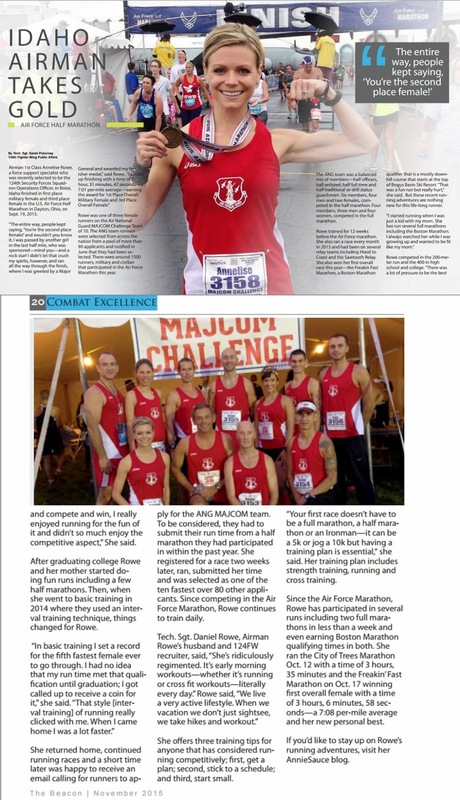 I did want to share something quick—the photo above—which is a snapshot from our wing's monthly newsletter and a recent article about my trip to the Air Force Half Marathon. It was a huge honor to be featured in that story, and again, it's just one of the amazing things I'm so blessed to be a part of with my commitment to the Idaho Air National Guard. This week, we look back on all of those who have gone before us with Veteran's Day. As I remember all who serve, who have dedicated their lives to the mission, and who have died defending it, I am so grateful to be a part of this amazing force. Thank you, Veterans. Truly, I wish I could update you with more. But for now, stay tuned. I will end by noting that what I do is something I love to do. I may only spend part of my time in the uniform as a "traditional" guardsman, but I am a member of the military all the time. Again, committing to serve my country was the best professional decision I've ever made. And it only gets better from here.